1. Cost of living index Enrique Soriano, Ateneo program director for real estate and senior adviser for Wong+Bernstein Business Advisory, and Lui Matti, executive director for asset services, CB Richard Ellis Philippines, chose the cost of living index as their top priority for the quality of living variables. 2. The affordability of rental and home ownership ranked second for Soriano, as he explained that amortization should take up 20 to 30 percent of the household income. 3. A well-masterplanned community is the most important item for David Leechiu, country head of Jones Lang LaSalle Leechiu. “This means the developer has a viable, sustainable, credible, long-term development plan for the city. The developer is not going to just cram buildings on the land without considering the traffic, access, drainage, parking and other infrastructure. This also includes the ratio of developed land versus open spaces such as parks, church grounds, events clusters and covered walkways. The city needs to have intense and reasonable regulation governing its districts, e.g. zoning, building guidelines, restrictions; that are not just fair but also enforced,” Leechiu said. Claro dG Cordero Jr., Jones Lang LaSalle Leechiu’s head of research, consulting and valuation, has a similar view, placing as his second priority the well-organized land use and development plan (as well as preventive programs that will mitigate effects of both natural and man-made adverse events). 4. Accessibility. Easy access to basic services (food, water, medical care, general security and safety, and education) is Cordero’s first priority. Matti lists as his fifth priority accessibility to schools, hospitals and recreational/entertainment centers including the presence of hospitals. Soriano’s third is convenience to and from the workplace and average commute time. Lifestyle factors such as places to socialize like bars, movie houses, supermarkets, malls and convenient access to leisure destinations is Soriano’s fourth top priority. Soriano cited the presence of wellness facilities as his seventh. Soriano said adult education or business schools and schools for children with a higher concentration of teacher-to-student ratio is his fifth priority. 5. Job opportunities. This would be Cordero’s eighth priority—the availability of employment/entrepreneurial opportunities. 6. Connectivity. Infrastructure support and facilities such as IT infrastructure (secure Internet and telecommunication networks), road networks, connectivity with other cities through airports and seaports is Cordero’s third priority. Matti’s second priority is infrastructure, including roads, public transport system and telecoms/Internet. 7. Low crime rate, rapid emergency response. Leechiu’s third top criteria of an ideal city would be security: not from crime, but that the city should have infrastructures for rapid responses to emergencies, services such as hospitals, ambulances, fire and earthquake, flooding and the like. High in education and low in crime is Soriano’s sixth criteria. Cordero’s fifth is a stable peace and order environment; Matti’s seventh would be a low crime rate. 8. Right of property buyers. Leechiu’s second most important criteria would be property rights of buyers being upheld and enforced: that the titles are clean and clear; and that there are no disputes to ownership due to conflicting claimants. 9. Environment and air quality. Low pollution levels is Soriano’s eighth priority. Matti’s eighth on the list is low pollution, as well. Cordero’s sixth is good balance of environmental preservation and urban development. Weather is a high factor for Matti in choosing the city to settle into. 10. Diversity for global market. Leechiu’s fourth priority is diversity: “The district should have elements catering to the global market: so to not just have multinational office locators and residents, but museums and other mediums of culture and education.” Cordero’s seventh is the presence of programs/developments that will support free exchange/discourse involving religion, culture and the arts; Matti’s third is language. He said it should be somewhere where this won’t be an issue for the person living there. Matti’s ninth priority is somehow related: friendly people. 11. Policies to attract outside capital. Leechiu chose this, but with a qualification: “I don’t just mean foreign capital, but capital from other local sources. The city developer has to allow other developers to put up projects provided they conform to the build guidelines. This will ensure that other ideas flow into the district that will benefit its stakeholders. By attracting capital from third parties, whether foreign or local, to develop projects, it will ensure diversity of ideas that will build character for the district,” Leechiu said. For this, Cordero’s fourth priority is needed: a credible, trustworthy and organized government (which would support the ease of doing business). What’s your own criteria of an ideal, most livable city? E-mail the author at tsalazar@inquirer.com.ph. 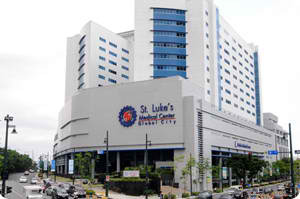 St.Luke’s Medical Center (SLMC) in Bonifacio Global City, Taguig is in the Top 25 most beautiful hospitals in the world, edging out hospitals from the U.S. and Europe on a list by a healthcare website. “Designs including warm woods and nature-inspired elements, soft color schemes, and exterior facades designed with regards to their natural settings placed these facilities on the list,” it said. St. Luke’s ranked higher than nine hospitals in the U.S. as well as hospitals in Austria, Australia, Lebanon, and Switzerland. “SLMC has received international accreditation and is recognized as one of the best hospitals in Asia and the entire world. As such, it regularly receives patients from around Asia, Micronesia, the Middle East, Europe and the United States,” HealthExecNews said. “Premium amenities like 620 modern hospital beds, computers with free internet connection in patient suites, 24/7 Concierge Service, shopping and dining spots, a hotel-like lobby and landscaped decks help make for one-of-a-kind patient experience,” it also said. SLMC welcomed its inclusion in the list, noting it was the first time that a Philippine hospital was included. “With this new honor for the country, let us be proud of the Philippines. Mabuhay!” the hospital said. At Eight Forbes Town Road, the day really begins the moment you look out. Mornings at home are made exceptional by the best, most privileged views of the Manila golf course. With your suite’s floor-to-ceiling windows, you don’t just enjoy a front seat to nature’s beauty – you experience the feeling of being right there on the green. And breaking free from daily demands of the city. Once the sun goes down, your adventures only get hotter. Go out and about Burgos Circle, set right at your doorstep. Here, a trendy mix of restaurants, cafés and shops comes alive with an exciting vibe- and keeps you partying well. Experience truly indulgent living, inside and out. Eight Forbes Town Road. • Luxury 53 – story address above the Forbes Town Center, offering the longest stretch – almost half a kilometer of Manila Golf course views. • First- rate play amenities such as infinity pool, pool deck, play ground, outdoor spa, reflexology path, Tai Chi station, jogging path, gazebo, covered trellis with sitting areas, gym, lanai, playroom and function rooms at the seventh level. • Two-level retail arcade at the podium, and steps away from the restaurants and shops of Burgos Circle. Experience Venice in All It’s Romantic Splendor Everyday. At the Venice at McKinley Hill, indulge in romantic moments again and again. Feast your eyes on the very best of Italy’s Venice at home. Look out your window and fall in love with the exquisite view of your very own St. Mark’s Tower. Make Memories for two right on your doorstep, and let a gondola take you down the Grand Canal and under the Rialto Bridge. Afterwards, discover the charms of the Venice Piazza from Alfresco dining at The Boardwalk to sight seeing at Doge’s palace to shopping at the retail center – there’s nothing you can’t do or enjoy. Let every experience come alive with a Venetian vibe. Only at the Venice. • From above, each of the seven towers resembles a “ferro” the gondola’s ornamental prow. • One-to three-bedroom suites with balconies. • Connected to the Bonifacio Global City and the Makati CBD via the exclusive Upper McKinley Road. THE BEST ADDRESS FOR TODAY’S ACHIEVERS, WINNERS AND LEADERS. Enjoy vital, vibrant living near Forbes Park. puts you next to the prestigious Forbes Park, and lets you move in the most elite circles instantly. an exclusive leisure deck. And links you instantly to the offices, schools and retail centers of McKinley Hill. minutes away, letting you connect to the best destinations at your own pace. Every single day. Make the big leap to a big-league lifestyle. Viceroy. Polo Club and the Manila Golf and Country Club. arcade with shops and restaurants. to Global City and the Makati CBD via Upper McKinley Road. Megaworld’s Uptown Bonifacio in Taguig City may be the new kid in town, but its vision—-to be the metro’s next central business district—-is anything but little. It’s anchor project, One Uptown Residence, is emerging as the urban address to beat, and is giving the young, successful set a vibrant taste of the future. Uptown is the new downtown. As the bright future of CBD living takes shape in Megaworld’sUptown Bonifacio, one thing is certain: the project’s master plan is truly a masterpiece. The 15-hectare community is an integrated setting that brings together luxury condominium enclaves, glamorous lifestyle destinations and state-of-the-art corporate hubs—-setting the tone and pace of action in Taguig City’s North Bonifacio District, a cutting-edge location on the radar of those making the big move to the top. 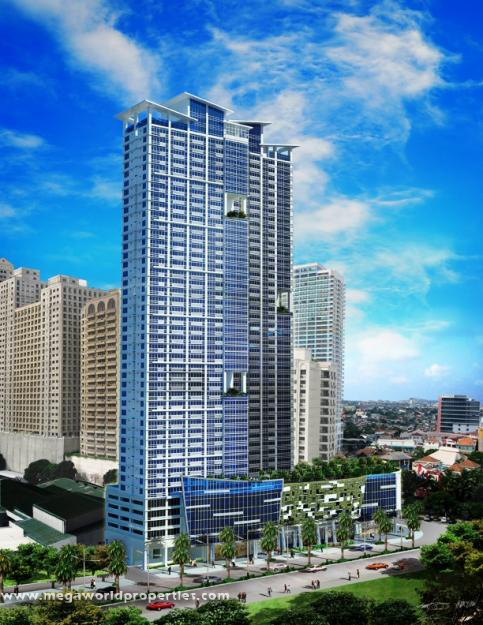 Megaworld will invest at least P25 billion to build Uptown Bonifacio over the next 12 years. The community, which will be developed in phases, offers close to 500,000 square meters of residential space, nearly 400,000 square meters of office space and about 90,000 square meters of retail space. The construction of the community’s first residential offering,One Uptown Residence, will begin in 2013. It will mark the debut of a modern lifestyle landmark that is set to change the face of the urban landscape. Designed to impree, the 45-story One Uptown Residence is rendered in glass and aluminum, with a streamlined architecture that is both bold and elegant. The tower divides into two residential wings, oriented to the north and south. In each wing, spaces have been reserved for bi-level sky gardens, located at the sixth, 15th, 21st and 27th floors. The podium façade is similarly proof of the project’s stunning aesthetic. Here, water cascades over a natural rock wall 20 meters high, and collects in a pond at the base. It’s a breathtaking view easily appreciated by residents returning home and passerby strolling at street level. For those looking to upgrade their lifestyle, the homes at One Uptown Residence convey an unparalleled sense of luxury. Homebuyers can choose from one-to-three bedroom condos. There are also two four-bedroom penthouse suites laid out at eh 45th floor—-ideal for people crave privacy and exclusivity. The leisure attractions at One Uptown Residence transform the way residents enjoy their downtime. At the 36th floor are sky lounges and two fully-aircinditioned badminton courts that convert into large function rooms. Meanwhile, the sixth-level outdoor deck features an infinity pool, children’s pool, Zen garden, lanai and outdoor area, the indoor amenity area on the same level offers more ways to play with its reflective pools, spas, yoga/Pilates room, gym/aerobics room, play room, game rooms, pre-function area and pantry. While the project brings together shops, restaurants and cafès in a cozy retail arcade at the ground level, homeowners can expect even more malling adventures. One Uptown Residence has a basement retail strip that serves as a connecting walkway to the three-level Uptown Mall next door. High-flying executives based at One Uptown Residence benefit even more from Uptown Bonifacio’s well-planned layout. The residential project is a short stroll away form the vorporate centers of Uptown Place, set along Megaworld Avenue, Uptown Bonifacio’s main boulevard. Exploring Global City is easy as it’s located just beyond the boundaries of the community. The city’s key destinations, including the British, American and Japanes international schools, St. Luke’s Medical Center, The Grand Hyatt and Shangri-La hotels and Burgos Circle, are all few minutes away through an efficient road network. Driving to key places outside Taguig City is also stress-free. The nearby C-5 Road connects to the Ortigas CBD and Eastwood City, while both McKinley Parkway and Kalayaan Avenue links instantly to the Makati CBD. Lawton Avenue, meanwhile, leads to the Terminal 3 of the Ninoy Aquino International Airport. Talk the talk of achievers. Walk the walk of winners. Live the life of leaders. This is thye vital, vibrant lifestyle at Viceroy, the new address for big shots at McKinley Hill. Everybody who’s anybody knows that making it big means moving up in life. And when it comes to neighbourhoods, there’s nothing like living next to Forbes Park, the Manila Polo Club and the Manila Golf and Country Club. For the young and successful set, moving in these elite circles used to be a pipe dream. Now, it’s a perk that comes with living at Viceroy at McKinley Hill. Rising 22 stories along Florence Way, the four-tower Viceroy offers condos for all kinds of go-getters. Single yuppies and career-driven couples feel instantly at home in a studio, which offers up to 26.5 square meters of space. Power couples with kids, on the other hand, can choose a 34.75-square-meter unit with one bedroom. The comfort culture is not confined to units. The exclusive plat deck at the second level is easily accessible with the push of an elevator button. Its outdoor amenities include a 15-meter lap pool with pool seats, wading pool, pool lounge, spa, fitness station, toddler’s play area, children’s playground and landscaped courtyard. There’s also a gym and day care centre at Tower 2, and two spacious function rooms at Tower 3. Residents can turn up the fun factor at the ground-level retail arcade. Here, trendy restaurants and boutiques offer a complete dine-and-shop experience at home. Lifestyle conveniences also guarantee stress-free condo living. Each unit comes with telephone/internet-ready lines and a provision for cable TV. The project also offers a continuous water supply, backup power, an advanced fire protection system, a 24-hour security system, high speed elevators and multi-level parking. As part of McKinley Hill, Viceroy enjoys an instant ink to the township’s leisure core, business centres and world-class institutions. The Venice Piazza, one of the metro’s most famous hot spots, is at the project’s doorstep. There’s never dull moment here with Venetian-inspired offerings such as the Rialto Bridge, St. Mark’s tower and Doge’s Palace. Authentic gondola rides at the man- made Grand Canal are an upcoming attraction. With the McKinley Hill CyberPark a short walk away, getting to work on time is easy. Its corporate hubs include One World Square, Two World Square, Three World Square, 8/10 Upper McKinley Road, 18/20 Upper McKinley Road, World Finance Plaza, Commerce and Industry Plaza, One Campus Place and the upcoming Science Hub and Eight Campus Place. Also within the community are the Chinese and Korean international schools, Enderun Colleges, the British, South Korean and Qatar embassies, as well as the Philippine Chamber of Commerce and Industry. Residents with cars can travel around with zero effort. Global city and the Makati CBD are easily reached via upper McKinley Road. Those headed to Ortigas can take the EDSA Kalayaan flyover or C-5 Road. The international airport and the city’s southern areas are quickly accessible through Lawton Avenue and Sampaguita West Ramps 1and 2, respectively. Owning a home at 101 Newport Boulevard is like having a VIP pass to the hottest destination in town. But it’s not just any hotspot—-it’s Newport City, where holidays happen everyday and feeling like tourist is actually a good thing. Visitors to Newport City have the pleasure of soaking up a dynamic global culture—-for as long as their holiday allows them. But it’ those who call Newport City home that have the privilege of enjoying a laidback vacation vibe all year round. It’s their privilege that lies at the heart of the lifestyle offered exclusively at 101 Newport Boulevard. For location alone 101 Newport Boulevard is the address to beat. It’s set along Newport Boulevard, the main avenue where most of Newport City’s world-class attractions are found. On any given day, residents can do as the tourists do, but without getting on a plane. Resorts World Manila, the country’s first-ever integrated tourism estate, is a short stroll away from the project. Resorts World, with its luxury hotels, gaming centre, shopping mall, performing arts theatre and fine dining restaurants, offers a wide range of pastimes for fun lovers. If Resorts World offers vibrant Las Vegas-style leisure, the nearby green is perfect for a more relaxed pace of play. Golfers can easily drop by the 60-hectare, 18-hole, par-72 Villamor golf course for a game, whether it’s on a weekend or a weekday. An Art Deco aesthetic makes 101 Newport Boulevard stand out even more. Each of the project’s four clusters has a façade featuring the vivid earth tones and nautical hues of Miami Beach. Bold vertical bands, striking relief accents and repeating geometric pattern bring a sense of richness to the design. Each cluster also has its own Art Deco –themed lobby and lounge. The second to the 10th residential levels host well-planned homes, the main draw of 101 Newport Boulevard. Studios range from 24 to 32 square meters, while one-bedroom units offer 35 square meters of space. On top of modern comforts, the project has recreational and retail zones, all easily reached by elevator. Family-friendly amenities make up second-level play deck. Outdoor offerings include a swimming pool with a decorative water feature, a pool lounge, sun deck, children’s pool, playground and fitness are. There are also green spaces such as a reading nook, trellised sitting areas and a large tropical garden. Inside Cluster 2 is a spacious gym, which comes complete with its own saunas and massage room. Cluster 3 offers a function room that’s ideal for big get-togethers. For sightseers that don’t want to stray far from home, a 3.6-meter-wide paved walkway winds around the base of the project. It’s ideal for those who want to take a quick stroll. It’s also the best way to explore the retail arcade at the ground level. Homeowners at 101 Newport Boulevard are not just masters of leisure universe—- they’re masters of the rush hour as well. Getting around Newport City is breeze. The offices of the Newport City CyberPark and the Genting-Star Tourism Academy are all within walking distance. Schools and workplace in Global City and the Makati CBD are a short drive away through South Luzon Expresswal (SLEX) or Lawton Road. Ortigas and Eastwood City are quickly accessible via EDSA Kalayaan flyover. Places in South are easily reached through Magallanes on-ramp. Non-drivers are just as mobile with the nearby Newport transport terminal offering a various transport options. An exclusive shuttle goes around Newport City at regular intervals. The CityLink bus line takes passengers to McKinley Hill and Eastwood City. There are also bus lines that ply routes in Quezon City, Marikina and Navotas and those that go all the way to Quezon, Batangas and Baguio. Cabs, meanwhile, are available around the clock. With the Newport City’s location across from Terminal 3 of the Ninoy Aquino International Airport, travelling abroad and across the country is easy, too. Residents can simply walk to the airport using a footbridge across Andrews Avenue. In a city where every residential condominium project is better than the next, the new One Eastwood Avenue is emerging as the first-choice address for a young and cosmopolitan set. Rising above the most prestigious location in Eastwood City, One Eastwood Avenue captures the energy and excitement of everyday life in a complete setting. It’s the latest residential offering for demanding, discriminating urbanities—-those who don’t want to settle for anything less than the best address in town. The modern One Eastwood Avenue is impressive in every way, from the outside in. 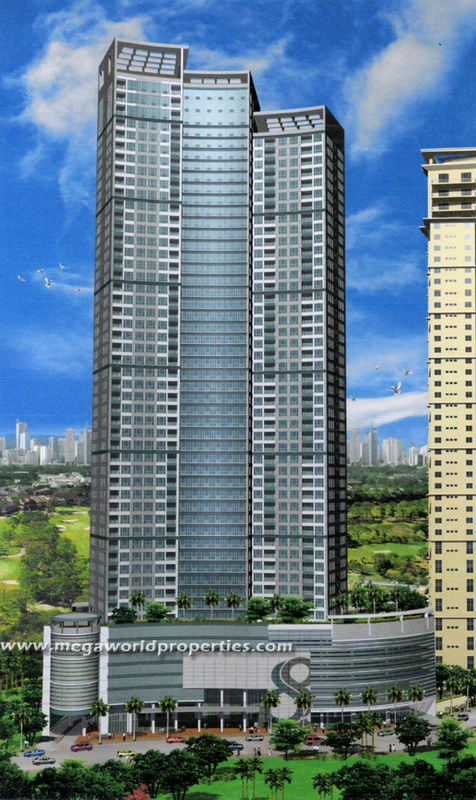 the project, soaring above Eastwood Avenue, is made up of two towers. Tower 1, with 47 stories, culminates in a winged crown. Tower 2, on the other hand, soars at 50 stories, dominating the skyline even from a distance. The project’s sleek blue-and-white frontage is predominantly rectilinear, except for the podium façade, which features a gently curving shape. On one side, the podium features an eco-wall, a vertical landscape of lush greenery. On another side is a state-of-the-art LCD video wall, showcasing a dazzling, ever-changing display of images that can be easily seen form street level. A wide, paved walkway winds around the base of the towers for strollers in the area. The ground level is home to a retail arcade, fronted by metal-clad columns and palm trees. This center of activity is the scene of friendly interaction, where specialty shops and restaurants converge to attract homeowners and visitors alike. For residents coming home, it’s a short walk from the main drop-off area to the lobby, also at the ground level. With its centrepiece chandelier, recessed lighting, polished floors, push carpets and chic furnishings, the lobby, like the project itself, is an eloquent statement of luxury. Lavish condos are the heart and soul of One Eastwood Avenue, and with the project’s wide selection of well-planned units, every kind of homebuyer has been taken into consideration. Studios are the perfect pick for young professionals. Ranging from 24.20 to 32.40 square meters in size, each has a sleeping den that doubles as a living room. Executive studios offer more privacy with an enclosed bedroom in a 35.30-square-meter area. There are ideal starter homes here, too. Young couples enjoy up to 46.40 square meters of space in one-bedroom units. For growing families, there are two-bedroom suites 75.80 to 87.10 square meters in size, complete with a master toilet and bath and a space-efficient utility/maid’s room. And because all condos boast wide windows, no view of Eastwood City is ever wasted. When it comes to making life easier and more comfortable, the project’s modern conveniences are second to none. One Eastwood Avenue boasts backup power, continuous water supply, an advanced fire protection system, a 24-hour security system, high-speed elevators and multi-level podium and basement parking. Each unit has telephone/internet-ready lines and a provision for cable TV that help keep homeowners connected and up to date. Residents are No. 1 not just in terms of location and accommodations but top-notch recreation as well. One Eastwood Avenue has a variety of leisure zones that keep both active players and casual spectators happy. At the outdoor deck at the seventh-level, there’s a 30-meter lap pool, which boasts an in-water lounge with jets. Next to it is a pool bench, pool deck, children’s pool, covered pool shelter, wooden sun deck, lounge, children’s playground, reflexology path, meditation garden and landscaped areas. A modern, fully equipped gym serves as the centrepiece of the indoor amenity area, also at the seventh level. Health buffs can lift weights or tone up on the treadmill, stationary bike and trampoline—-all while watching the morning news on the mounted LCD TV screens pr admiring expansive views of City Walk 1 and Central Plaza from floor-to-ceiling windows. Nearby, a yoga-Pilates room, play rooms, game rooms, a lanai, function rooms, a bar and lounge are also available for the residents’ exclusive use. The feeling of pleasure continues on the higher floors. Sky graders at the 18th, 28th and 38th floors give nature lovers a rich dose of green. The gardens, each three stories high and enclosing a 73-square-meter space, feature sitting areas amid lush tropical plants and trees. At the roof deck of Tower 1, two-air-conditioned badminton courts welcome sporty types. Easily hosting a doubles game by the day, they convert into large function areas at night. With full glass windows, nine-meter-high ceilings, pendant lamps and decorated walls, they impress even the most discerning party guests. The roof deck also hosts a sky lounge, an open-air space that overlook the city. For those that choose Three Central, get ready for a real adventure. Experience the Makati business district up close from this luxury address—-where the drive to succeed is super-sized and life’s great achievement is to soar high. Power players who have put Makati on top of their wish list can now call the CBD their address. Three Central follows hot on heels of One Central and Two Central, its relatively young predecessors in the same location—-and gives homebuyers another rare opportunity to flout the status quo and showcase their successful status in life. In a city that ups the ante in almost everything, the 50-story Three Central emerges as the next big thing in CBD living. Taking its inspiration from the iconic International Finance Center in Hong Kong, the project exemplifies the cutting edge in contemporary architecture. But it’s not just how it looks that lets its stand out. The project , set along Valero Street in Salcedo Village, soars high above the side of Ayala Avenue. It’s location that puts office such as RCBC Plaza, GT Tower International and Ayala Life-FGU Center close by—-and allows residents to easily navigate and corporate Makati without sparing a second thought to the rush hour. The luxurious offerings at Three Central make indulgence a way of life. From the sleekly modern lobby enclosed in floor-to-ceiling glass, residents are ushered to their homes on the residential floors via high-speed elevators. Young executives discover a personal haven in a studio at least 39.60 square meters in size. Power couples enjoy 78 square meters of space in a one-bedroom suite with balcony, utility room and maid’s quarters. Meanwhile, families find more space to bond in a combined studio-suite, where a balcony provides compelling skyline views. Three Central is designed to preserve the peace of mind of residents. Aside from efficient and uninterrupted power and water supply and dependable fire and security systems, homeowners enjoy an intercom with security camera in their unit, telephone/internet-ready lines, a provision for cable TV, multi-level parking and quick access to the project’s very own two-level retail arcade at the podium. In contrast to the ultra-serene spaces of the condos, the recreational deck at the seventh level is a lively setting. Aside from a lap pool, this private and exclusive playground features an in-pool lounge, a children’s pool, an outdoor pool lounge and spa, pool deck, children’s playground and gazebo. Quiet types also have their pick of amenities with Three Central’s very own reflexology path, meditation garden, linear garden, palm court, pavilion/reading nook and trellised and alfresco seating areas on the same level. Residents are guaranteed the best in indoor recreation, too. A gym lets fitness fanatics work out at home. A large culinary station—-complete with an open kitchen and sushi, kebab, pasta and pastry stations—-is perfect for those who love to cook, while three function rooms let home chefs try their hand at entertaining. Meanwhile, a day care center and business center nearby make everyday life more convenient. Megaworld’s three “central” addresses are currently enjoying a warm reception from CBD-loving homebuyers. One Central, now 15.63 percent complete. Is nearly 87 percent sold and is set to be turned over by Dec 2012. Two Central is 85 percent taken up and slated for completion in June 2014. 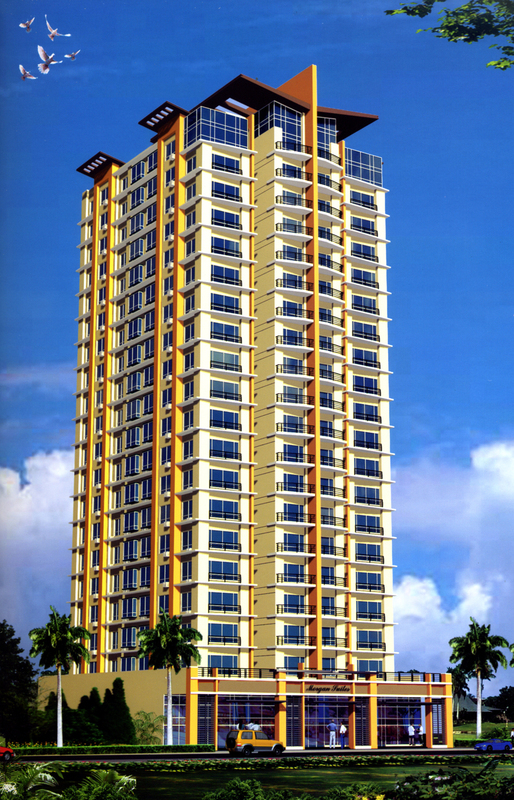 Three Central, launched only this October, is already 13 percent sold, with 91 of its 672 units taken up. The project is targeted for delivery in June 2015. For its second township project in Metro Manila, premier property developer Megaworld Corporation decided that going big was the only option. 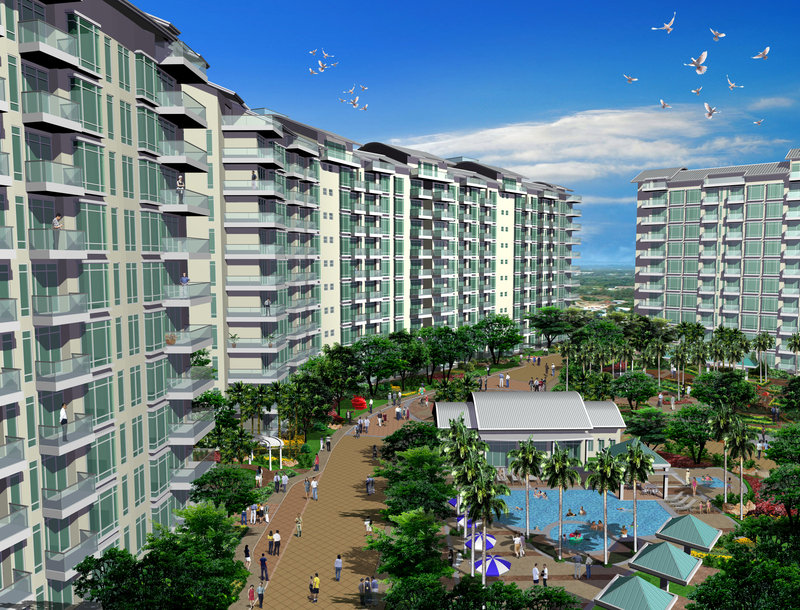 At 50 hectares, McKinley Hill has what it takes to realize Megaworld’s vision of a complete and integrated community. 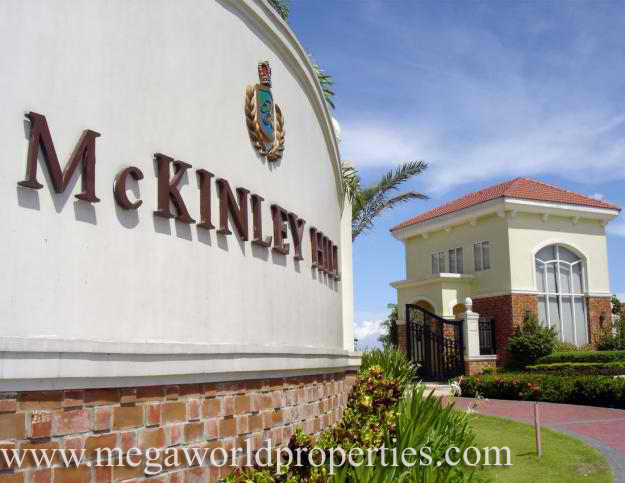 Bigger isn’t always better in real estate, but for McKinley Hill, size does matter. Encompassing 50 hectares of prime land in Fort Bonifacio, Taguig City, McKinley Hill makes a massive impact on Metro Manila’s landscape and skyline. Like Eastwood City, it’s successful predecessor in Quezon City, it underscores Megaworld’s expertise in creating large-scale, value-oriented, life-changing communities. But its transformation from blueprint to reality is an accomplishment all its own. For a development that only started to take shape in 2004, the McKinley Hill of today has very little in common with its embryonic self. Its growth—in less than five short years—has been nothing short of phenomenal. From 2004 to mid-2009, the township went on a home-building spree, launching seven residential projects in quick succession. Today, the residential block is an impressive showcase of Mediterranean-style houses, mid-rise garden villas, high-rise condominiums and dormitory-style residences. Construction also hit its stride at the McKinley Hill CyberPark, where seven office buildings came on stream from 2007 to mid-2009. Targeting the business process outsourcing sector, the cyberpark currently provides office space in a variety of high-tech corporate buildings and a groundbreaking camps-type development. An institutional block, currently home to embassies to international schools, each in its own setting, gives McKinley Hill its world-class character. An upcoming town centre with retail and leisure amenities, on the other hand, is set to give a Venetian spin to everyday recreation in the community. While a diversity of developments gives life to McKinley Hill’s live-work-play-learn aesthetic, an unparalleled location makes it not only a cosmopolitan destination but also a gateway to important places. From Fort Bonifacio, the project connects directly to Bonifacio Global City through Upper McKinley Road. The business districts of Makati and Ortigas are minutes away via the EDSA Kalayaan flyover and C-5 road. The international airport is easily accessible through Lawton Avenue, while the metro’s southern areas are quickly reached through the Sampaguita West Ramps 1 and 2. Nothing blends into the background at McKinley Hill. Here, every development has been designed to stand out and make an impression. At the residential block, seven communities surprise and engage buyers with their dramatic sense of scale and uncompromising stance against predictable, cookie-cutter real estate. If the details are what make a home, McKinley Hill has successfully tapped in the essence of living well. By their size alone, the township’s seven residential communities epitomize luxury at its very best. And with their distinctive design themes, they accommodate and satisfy all manner of customer tastes and expectations. McKinley Hill’s first salvo in the residential block is the McKinley Hill Village, launched in 2004. The project’s location near the iconic Forbes Park and the Manila Golf and Country Club makes it the perfect address for upscale clients that move in the most elite circles. The community offers 469 prime subdivision lots, ranging from 188 to 296 square meters in size. Lot owners have the freedom to design their dream homes based on any of the eight architectural designs: Tuscan-inspired plantation villa, Lisbon-inspired-inspired contemporary mansion, Lyons-inspired modern mansion, Cadiz-inspired Spanish-Mediterranean casa, Seville-style patrician casa, Paris-style neoclassic chateau, Florida-inspired waterfront residence and Southern-Californian style estate house. 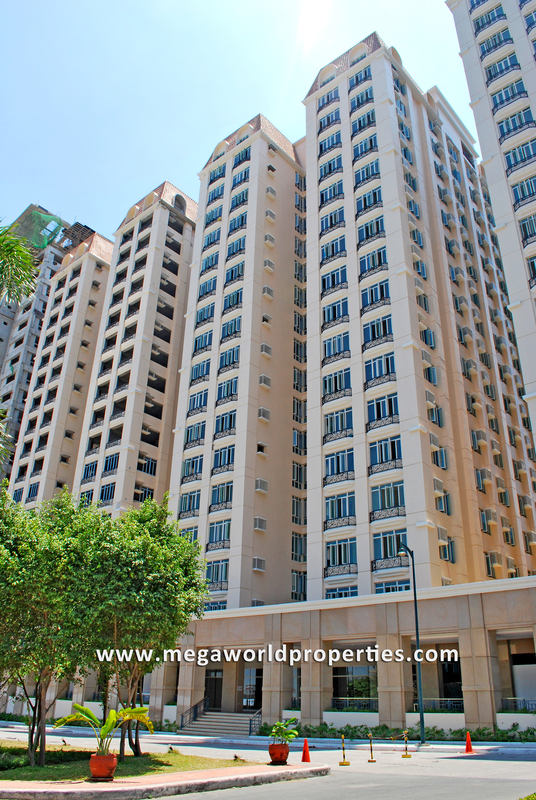 To date, McKinley Hill Village is almost completely sold out. Its sprawling landscape is dotted by 34 completed houses. Thirty-seven more are under way. A clubhouse nearby houses a gym and function hall right next to an Olympic-size swimming pool, children’s pool, Jacuzzi and playground. Meanwhile, condominium units with a Spanish-Mediterranean flair make up the McKinley Hill Garden Villas. The buildings resemble villas with their low-pitched tiled roofs, pastel-coloured facades and wrought iron balcony grillwork. The project;s sold –out first phase, launched in 2006, hosts limited edition two-to-three bedroom homes in four clusters ranging from four to five stories. In 2007, Phase 2 unveiled 117 units in four six-story clusters. Today, 91 percent of its one-to-three bedroom lofts are taken up. First-class play amenities such a swimming pool, game room, playground, function area and lush gardens can be enjoyed by homeowners in both phases. Stamford, a sold-out, three-tower community designed for success-driven professionals, offers luxurious conveniences in a contemporary setting. Its studio units, offering 22.5 to 32 square meters of space, are a short elevator ride away from a ground-level retail arcade. For those that need a private place to unwind, the roof deck at Towers 1 and 2 features a lap pool, pool deck and landscaped greenery. Morgan Suites also caters to executives on the go. The three-tower address offers studio units and one-bedroom suites that come with a full range of creature comforts. A retail arcade at the ground level offers the daily essentials, while recreational amenities such as a lap pool, badminton court and multipurpose hall are reserved for the residents’ exclusive use. What’s more, those that call Morgan Suites home enjoy a location right across from One World Square at the McKinley Hill CyberPark. Since it was introduced in 2008, the project has enjoyed a warm reception. The first tower is sold out, while the second tower is 39 percent taken up. The last tower is yet to be launched to the public. Two of McKinley Hill’s residential projects take their inspiration from the most beautiful places in Italy. The Tuscany Private Estate pays tribute to Tuscany, one of Italy’s most famous wine regions. Now 67 percent sold, the 1.5 hectare enclave is made up of seven residential clusters with diverse facades in festive hues. Buyers that want to get in on the lifestyle offered at The Tuscany have a choice of executive studios or suites with one to three bedrooms. Penthouse homes are also available in one-bedroom loft or two-level, three bedroom layouts. Healthy recreation is very much a part of everyday life in the community. Lush greenery encircles a play area called Isola Toscana, which showcases a variety of pools, a sunbathing lounge, spa/sauna, massage room, gym, function room, play room and playground. A nature park with a pond and a lagoon can be found at the Parco Bello. Another main attraction is the Ponte Vecchio, a four-level edifice inspired by its namesake, the most famous and oldest bridge in Italy’s Florence. The Venice, in the other hand captures the magnificence of Italy’s Venice. The community boasts seven residential towers, each resembling a “fèrro”—-a gondola’s uniquely shaped iron head—-from above. The recently launched Alessandro and Bellini towers, now 63 and 37 percent sold respectively, give buyers a choice of executive studios or one-to-three bedroom suites with wide windows and balconies. Steps away from the homes is an oasis brimming with first-rate play amenities. There’s a swimming pool, fitness station, play area, tennis and badminton courts, an outdoor spa, a children’s pool and playground, palm court, pond, fountains and sculpture, rock and mediation gardens. The towers of The Venice overlook the Grand Canal at the McKinley Hill town center, which offers authentic gondola rides. Meeting the lifestyle needs of BPO employees working at the nearby cyberpark is The Woodridge Residences. Completed in June this year, the project offers quality, affordable housing in its two six-story buildings. Dormitory-style living is made more luxurious in the project;s executive studios, boasting efficiently-planned living space for two, four, six or 10 occupants. All homes are pre-furnished with air-conditioning units, an optional single bed and sturdy double-deck beds, comfortable mattresses and metal lockers. Each floor of the project features a communal pantry with its very own TV set. Selected Wi-Fi ready areas, meanwhile, make it easy for residents to stay connected. Adding to the list of conveniences are daily housekeeping services and 24-hour security. Can one enjoy the perks and privileges of a vacation-resort lifestyle within the confines of the metropolis? At The Parkside Villas, he most certainly can. The Parkside Villas offers all manners of pampering fit for an out-of-town getaway right within Megaworld’s Newport City urban township at the Villamor Airbase in Pasay City. Here, one will experience a whole new sense of comfort and well-being, whether his home is an executive studio or a four-bedroom unit. Spectacular views greet him from the floor-to-ceiling windows and balcony of the homes neatly tucked in seven clusters right next to two leisure landmarks: the championship-level Villamor golf course and the five-star Marriott Hotel. For those who put a premium on wellness-and fun- a resort-like playground waits at the ground level. Among its come-ons is a swimming pool, an outdoor therapeutic spa, a clubhouse, bar, barbecue pit, exercise station and jogging path. There’s a pool, an art plaza and a playground for children, while a gazebo and pavilion are perfect for small gatherings. As abundant as the modern conveniences are nature’s gifts. With 50 percent of the community set aside for open space and lush greenery, one can explore the outdoors safely—-without ever leaving home. For golf aficionados, the 60-hectare, 18-hole, par-72 Villamor fairways offers thrills of a different kind. Here, club members can enjoy everything from the practice greens and driving range to the golfers’ lounge, tee house, pro shop, restaurant, cafè, pool and massage and function rooms. Non-golfers, too, will find the fairways—-lined with agoho, ipil-ipil, narra and mango trees dotted with colourful Indian tulips—-a feast for the senses. Right next door is the Marriott Hotel, ready to roll out the red carpet for those who wish to be pampered in its full-service spa or sumptuous rooms to celebrate a milestone in its fine-dining restaurants. Meanwhile, the nearby Newport Entertainment and Commercial Center offers a long list of things to see and do with one’s loved ones. The three-level pleasure palace hosts an explosion of haute shops and boutiques, specialty stores, bars, bistros, pubs and restaurants offering East-West cuicine topped by four modern cinemas. What’s more, the private oasis at The Parkside Villas owns an unmatched location that assures its residents easy access to the metro’s key destinations. The enclave is located right across from Terminal 3 of the international airport, close to Magallanes Village. The Makati CBD and Bonifacio Global City are within easy reach through the South Luzon Expressway or Lawton Road. Ortigas and Eastwood City are also a short drive away via EDSA Kalayaan flyover and C-5 Road. Eight Forbes Town Road soars as a towering symbol of personal achievement above the symbol of personal achievement above the archetypal leisure spot for the elite: the Manila Golf and Country Club. Megaworld’s 53-story residential project at the Forbes Town Center in Bonifacio Globbal City, Taguig, is a tribute to upper-crust sensibilities, both inside and out. The streamlined façade is awash in light blue hues, while the top is remarkable for its modern motif. Inside, the elegantly appointed lobby, sheathed in glass, offers a life-size view of the celebrated golf course. At the upper levels, the one-to-three bedroom homes ratchet up the wow factor with a roomy layout that allows one to relax privately or entertain friends in style. And choice units look out on the breathtaking zoysia-covered fairways, punctuated with shade trees, white sand and watercourses. The seventh level, with numerous amenities instantly on tap, is certain to be a magnet for the fun set. These range from an infinity pool and a shallow pool with water jets to a reflecting pool, pool deck, jogging path, outdoor spa and reflexology path. Children have their own space to play at the wading pool and playground. There’s also a gazebo, a covered trellis and sitting areas for those content to gaze at the golf course. Indoors, there are more opportunities for recreation. There’s a gym, lanai and playroom for the residents’ exclusive use, not to mention function rooms for meetings and celebrations. For people who knows how to live well, quick access to shopping and leisure is essential. In this regard, Eight Forbes Town Road’s podium hosts a two-level retail arcade with a variety of convenience and specialty stores, making shopping an enjoyable pastime any day of the week. And just a few strides away from Forbes Town Road, a high-end retail strip inspired by Singapore’s Bugis Junction. It will host more than a hundred casual and fine-dining restaurants and haute couture shops. And the project has the best location in the Global City, hands down. The Makati and Ortigas business districts are a short drive away via the EDSA Kalayaan flyover, McKinley Road or C-5 Road. The Manila Polo Club and Forbes Park are just in the vicinity, as are the British, Japanese, American, Korean, Chinese international schools and the upcoming embassies of Britain, Korea and Singapore. Conveniently close by are PriceSmart Membership Shopping, MC Home Depot, and Market! Market! And an upcoming state-of-the-art facility of St. Luke’s Medical Center.